UK holidaymakers are being urged to get clued up on local customs and laws before heading abroad. Many tourists are currently extending a romantic Valentine's weekend getaway into a whole week. The Foreign & Commonwealth Office's (FCO) Know Before You Go awareness campaign is now aiming to protect them against unforeseen stress. Protecting people against unforeseen surprises is what travel insurance does best. A range of cover options can tackle flight cancellations and even protect gadgets. The FCO's John Heppenstall, who oversees the department's consular campaigns, has recommended a comprehensive policy when it comes to travel cover. He also advised holidaymakers to keep their wits about them. - A romantic beach may be free of lovers walking hand-in-hand for good reasons, such as stinging jellyfish. - Pickpockets regularly target Eiffel Tower sightseers. 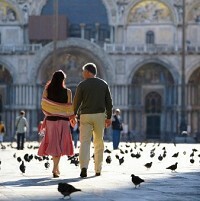 - It is against the law to feed pigeons in Venice. - Distraction thieves can target the passports and cash of Spanish airport passengers. Alertness is the key, according to the FCO, no matter how familiar holidaymakers are with overseas travel. In addition, FCO officials warned holidaymakers that they should make sure that their travel documents and passports are current and valid. - City breaks are now more popular than beach breaks and this is expected to continue into 2015. - Some 43% of Britons are planning city breaks this year, with 42% organising beach ones. - More than one in three (35%) Britons are feeling adventurous, claiming they will visit a new country for the first time this year.